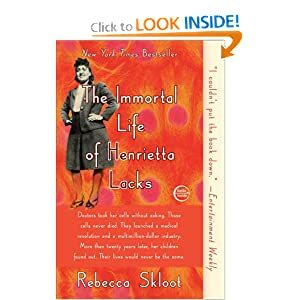 Just the simple facts are hard to believe: that in 1951, a poor black woman named Henrietta Lacks dies of cervical cancer, but pieces of the tumor that killed her--taken without her knowledge or consent--live on, first in one lab, then in hundreds, then thousands, then in giant factories churning out polio vaccines, then aboard rocket ships launched into space. The cells from this one tumor would spawn a multi-billion dollar industry and become a foundation of modern science--leading to breakthroughs in gene mapping, cloning and fertility and helping to discover how viruses work and how cancer develops (among a million other things). All of which is to say: the science end of this story is enough to blow one's mind right out of one's face.